I am new in this forum.I don`t speak english well but I will try it. I searched on Internet but I didn`t find anything about this type of panther. Thanks in advance and sorry for my english!! I was surprised to read of your Panther with a Panzer IV turret. As far as I was aware there was no such vehicle. There was a Panther command vehicle - the Panzerbefehlswagen mit 7.5cm KwK42 L/70. There seems no reason to try to fit a Panzer IV turret to a Panther. Fitting a less well armed less well armoured turret when command versions of the Panther were available seems very strange. I do not know if the PanzerIV turret even would fit a Panther turret ring. 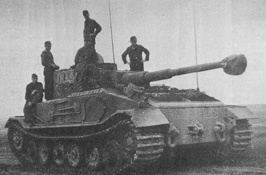 Given the apparent lack of any reference to a Panther with a Panzer IV turret either on the internet or in the standard texts, I would suggest that this Tiger (P) might be the vehicle you have seen reference to. The dates of its use certainly match the ones you give. If you could provide the quote where the Panther with Panzer IV turret is mentioned perhaps this could be resolved. "If you could provide the quote where the Panther with Panzer IV turret is mentioned perhaps this could be"
I wonder what it was used for, surely it would have been inferior as a fighting vehicle to the PkzfwV. Last edited by davethelight on 12 Jun 2003 12:27, edited 1 time in total. which all agree with this, it was used as a command vehicle in this unit. Many thanks MadderCat and liki for the pics and links. I stand corrected it is indeed a Panther with a Pz IV turret. Such a curious vehicle, especially if the turret was bolted in a fixed position. As the turret was designed to traverse I presume the gun mounting had no lateral traverse at all. To be usable the entire vehicle would have to be aimed at the target... hardly an easy, swift or accurate procedure. 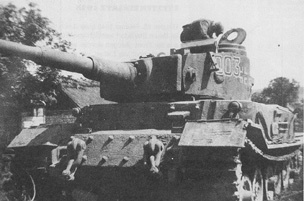 Unless the turret of the to be converted Panther had been destroyed, the use of a Bergepanther chassis would make more sense. The turret would have provided space for the use as a command vehicle. If no or virtually no ammunition was carried then there would be space for extra radios and perhaps map storage etc. Another vehicle to be added to the list ofone-offs or very rare coversions. I know there are great pictures in "Combat History of Schwere Panzerjäger-Abteilung 653 by Karlheinz Münch ", but I have never seen it. The Combat history of 653 says it was a 'recovery' Panther with a Pz IV turret bolted in place and not able to rotate. Scanner is out so I can't post pics! Hello Liki,I see you´re also a Spaniard. Javichu I would like to see your pics of Ammunition vehicles on T34 chassis, if you can. I have never seen Panther with FlaKvierling too. You are french or spanish? OK .Maybe a Munitionspanzer T34???? Bef-Tiger and the 2 muni-pz T34 have been destroyed. very high 2 muni-pz T34 good targets? 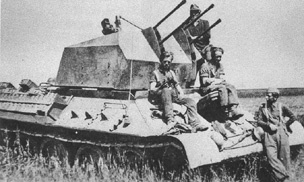 After combat 18 july- 5 august against the southern flank of the large soviet offensive in the ukraine, to the 653 there remains only one elefant company.